Since we converted our salt-water chlorinated swimming pool to a fresh-water swimming pond 6 years ago it has gradually become a more inviting habitat for many local creatures as well as being a delightful place to cool off during the summer months. 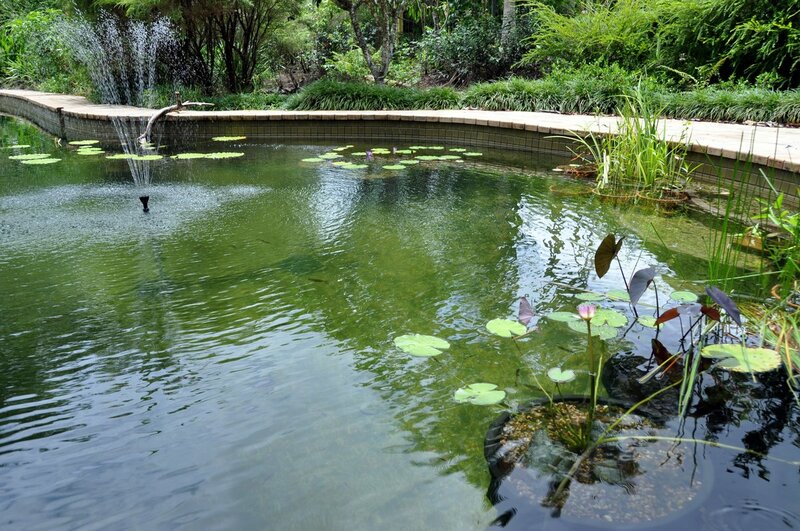 Fresh-water swimming pond with fish and plants. 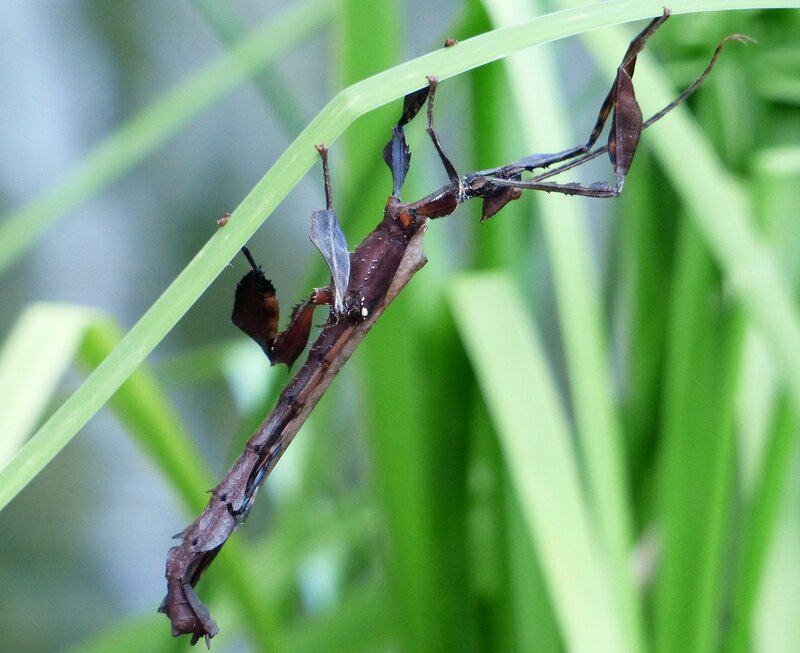 I walked into the pool garden this afternoon and was amazed to find a male Macleay’s Spectre hanging, in a typical pose, on the strap-like leaf of a Louisiana Iris that is growing in a pot on the steps. 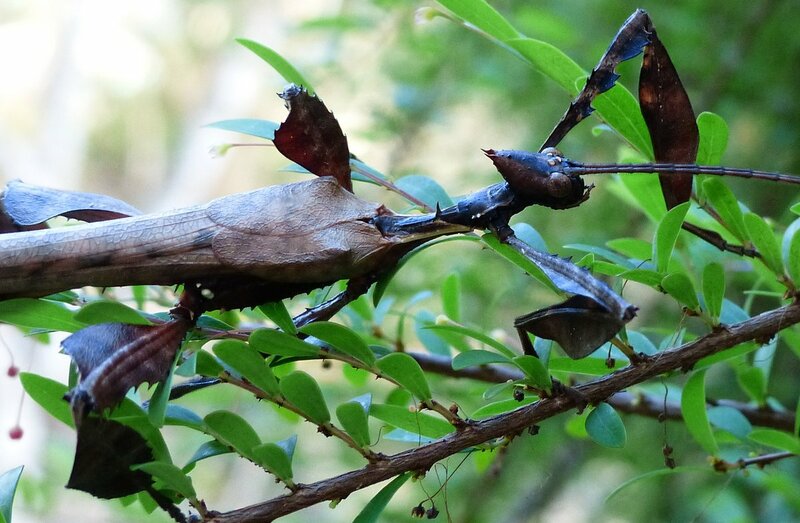 This extraordinary Phasmid is widespread in parts of New South Wales and S.E. Queensland and it also inhabits North Queensland rainforests ‘though as you can imagine they are not easily found. After taking a few photos I invited it on to my finger so I could move it onto a shrub in the garden as it looked so vulnerable on the edge of the pool. After waiting more than 20 years to find a Macleay’s Spectre on the property I didn’t want it to indulge in unnecessarily risky behaviour. In order to take a better photo of the head I had to gently encourage the insect to the top-side of the branch where it ‘froze’ in position no doubt trusting that its amazing camouflage would protect it from attack. After the photo session I watched as it made its way further into the protection of the twigs and leaves. 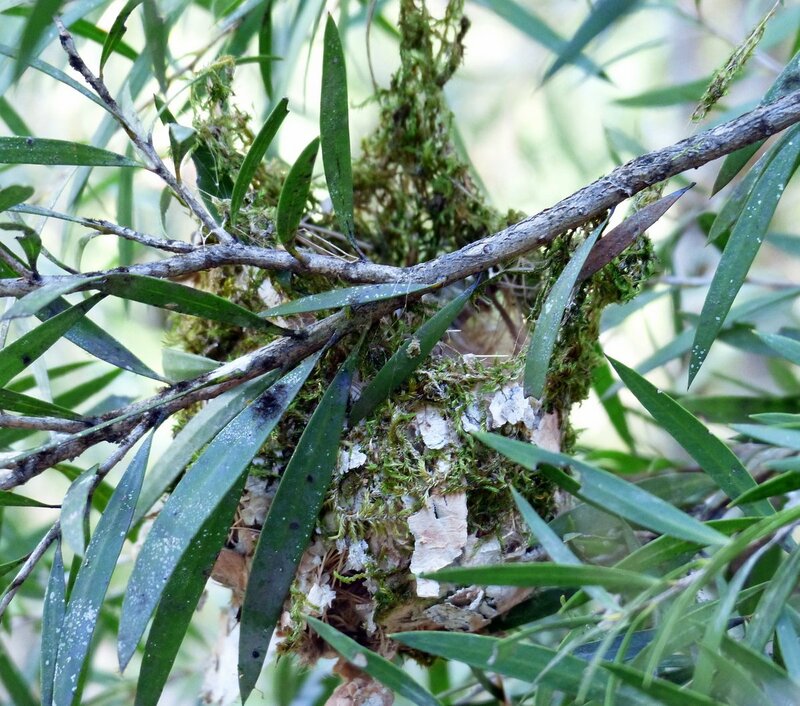 Another delight in the pool garden this afternoon was the discovery of this exquisite nest which I am fairly certain has been built and used by a pair of Graceful Honeyeater although as the nest is now abandoned I can not be sure of the owner/builders. We had noticed, of late, that our broadband internet was not living up to its promised speed but we kept making excuses for it. On Saturday evening we had some heavy rain (153mm) and on Sunday we were unable to make a successful internet connection although the modem was telling us we had. To cut a very long story (2 hours on the phone to the ISP) our signal has dropped to unacceptable levels due to water leaking into a previously sealed beam thingy (sorry to be so technical). Plastic components do not last long in the tropics! Now a further wait for a technician plus new part…..however, all is not lost. We now have wireless technology via the nextG and while rather expensive the pre-Christmas special is helpful and at least allows us to remain in touch with the outside world. While our focus is always on the environment; learning about it, and living in it as sustainably as we are able we find that communicating via the internet has become a major part of our life. Emails save trips to the post box which is 2.5km away and banking via the internet saves a 35km trip so although it is certainly possible to survive without it we are pleased that we don’t have to. So it would seem after some more rain in the early hours of this morning and continuing isolated showers that our long dry spell has well and truly finished. We have started planting out some native grasses that we’ve been propagating as well as a few more trees and shrubs here and there – a lovely time of year. 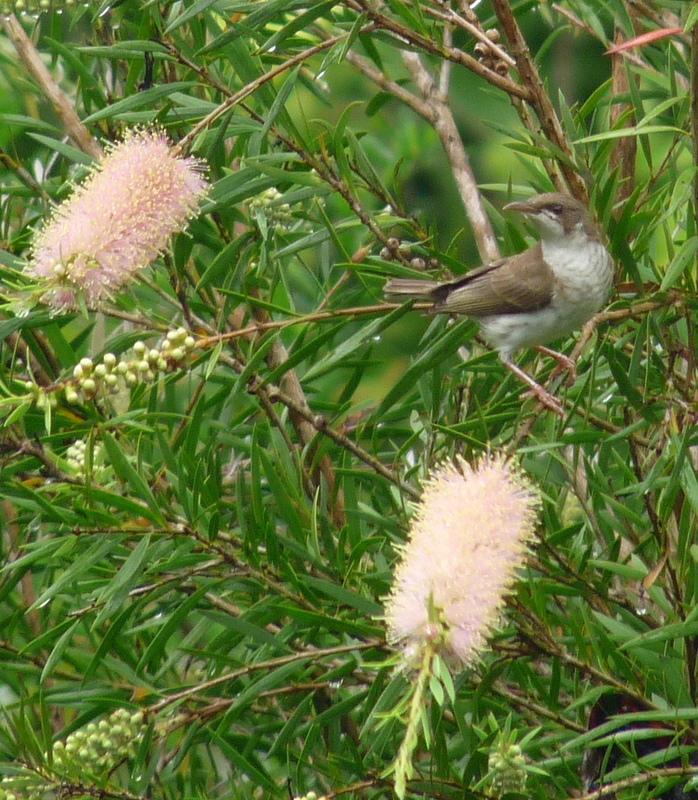 From the verandah I managed a couple of shots of this Brown-backed Honeyeater enjoying a quick feed on Callistemon “The Bluff” in between the showers. 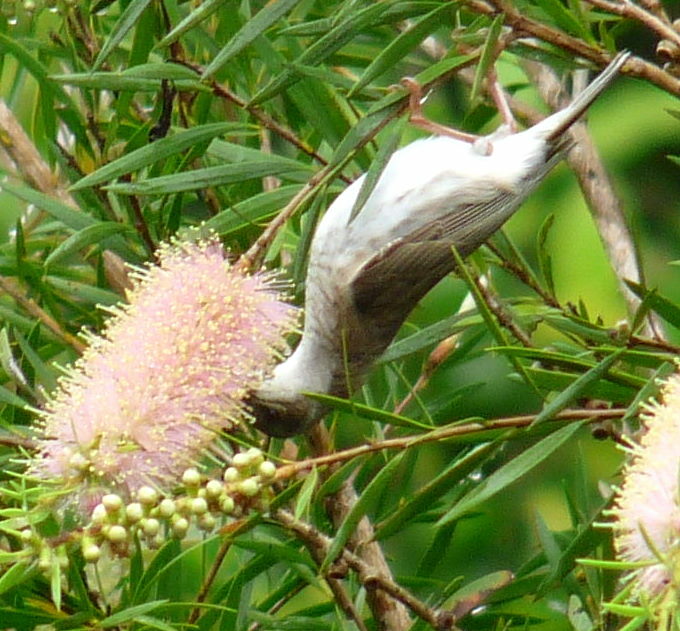 A variety of Callistemon certainly provide a reliable food source for the nectar eaters. For many years we have been considering our general energy consumption and in the last 18 months we have made some major changes. Last week, after many months of planning, waiting and then changing contractors we were finally able to take a very big and exciting step forward. We have had a 1.5kW grid connect solar power system installed. We were delighted with the efficiency and enthusiasm of the installers and now we are thrilled to observe one of our meters going in the reverse direction! There is now a wait for Ergon Energy to install digital meters that will record exactly how much power we are exporting to the grid so that we can be credited accurately. We were able to take advantage of the Federal Government rebate which is available for a 1kW system and which we understand will not be continued after June 30th ’09.